I've been thinking about this a lot lately. So often we want to make changes to our behaviour and lifestyle but we don't ever actually achieve results. We think that merely by making a plan we will automatically move towards fulfilling it. In my experience that rarely happens. In my opinion that's wishful thinking. It's almost like hoping on a magic fairly godmother to wave a wand and miraculously change our behaviour or circumstances without us doing a thing. Yep... it's too good to be true. Instead of wishing on the impossible, or at least the highly improbable, why to make small changes in behaviour that reflect the person you want to become - your future self. Today this is the behaviour I'm going to try out. 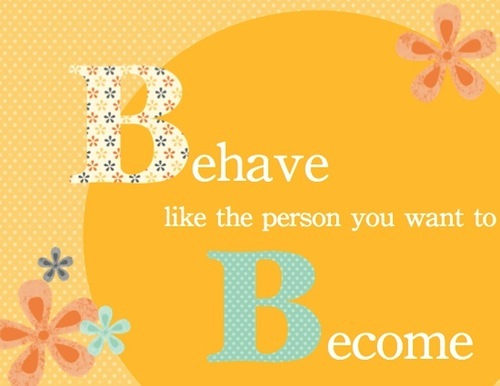 Behave like I'm already the woman I want to be... and see if I can't make some small steps towards succeeding.